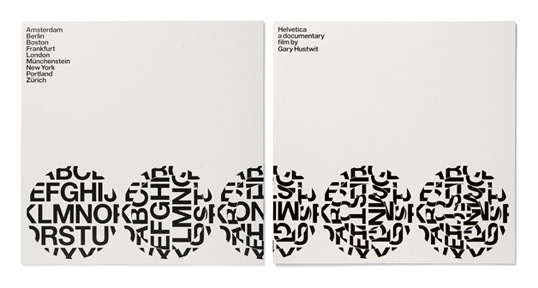 “In 2007, we were involved in a documentary about the typeface Helvetica, a movie directed by Gary Hustwit. Our involvement in this project basically consisted of designing two film posters, and making a short appearance in the movie itself. 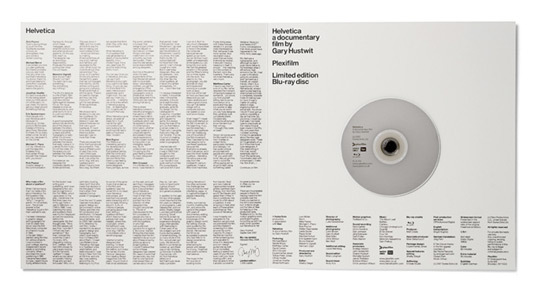 (More about the documentary can be read at Helvetica / Hustwit). In 2008, Gary approached us again, to design the limited edition packaging of the Blu-ray version of the documentary. The DVD version already came out in 2007, so did a special, limited edition of this DVD. The Blu-ray version was released in 2008, and of this version, Gary wanted to bring out a special, limited edition as well. And that’s where we came in. Thinking about a packaging for this Blu-ray disk, we first started to consider the whole concept of Blu-ray itself. It is yet another format, the latest in a string of formats, and just like VHS and DVD, this format will be obsolete soon. This whole theme, of obsolete formats, is something that we have always found interesting; in fact, towards the end of 2000, we dedicated a whole issue of Emigre magazine on this subject (see Lost Formats). So we thought it would be interesting to come up with a packaging that would revolve around this whole theme of formats. That’s when we decided to package the Blu-ray disk in a record sleeve, referring to the vinyl 12” LP, a now almost defunct format. There’s also another reason why we chose a record sleeve as packaging. When we first met Gary, he tried to explain the concept of the Helvetica film to us. “A rock documentary, but about a typeface”, that’s how he described it to us. 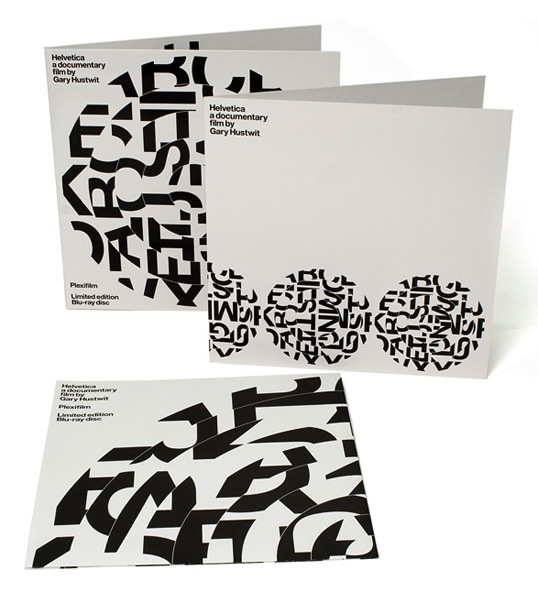 So a record sleeve as packaging for this documentary made perfect sense to us. The idea of the spiralling discs came from the ‘Meet the cast’ poster that we made earlier for Gary (see Helvetica / Hustwit). 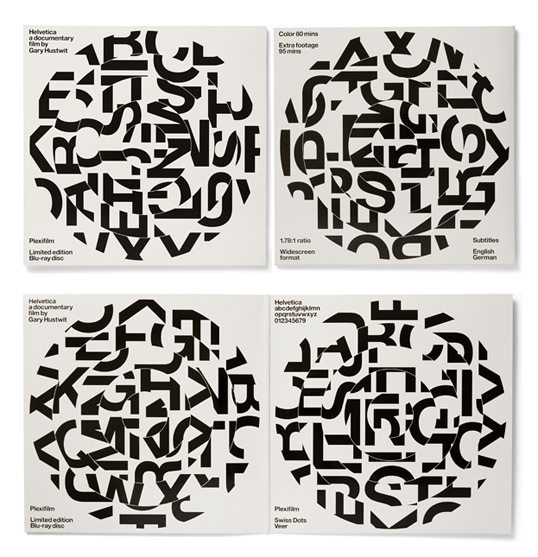 For the sleeve, we wanted to use the Helvetica alphabet as it was shown on that poster, but we also wanted it to refer to the idea of a 12” vinyl record. So we started spiralling the alphabet, referring to the way a record spins, but also to the idea of a record divided in tracks. 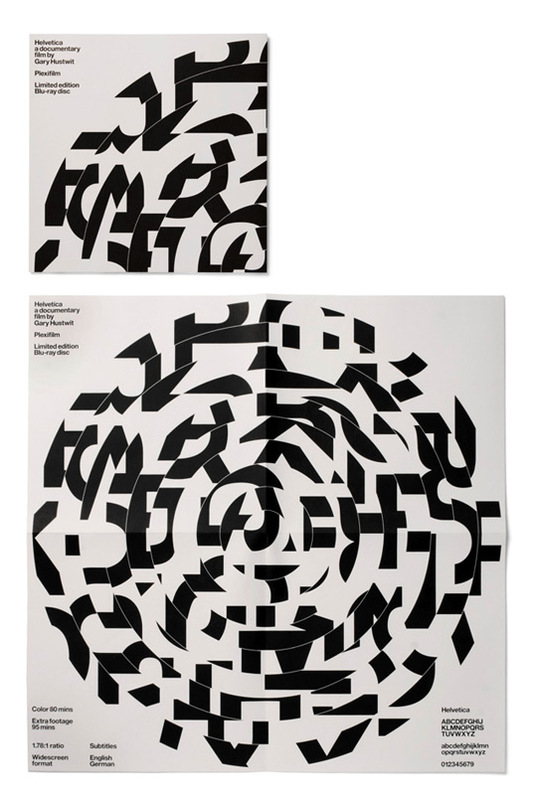 (By spiralling the disc in different ways, we could come up with different variations; as you can see on the gatefold sleeve, each version is slightly different).